One of Telford’s largest and longest established employers is contributing to Telford’s 50th birthday celebrations by regenerating the Hortonwood traffic island as a legacy project and gifting it to the community. 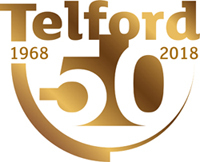 The creation of legacy projects is one of the most important aspects of Telford’s 50th birthday celebration; it was one of the themes supported most strongly by local people during consultation on the 50th year celebrations. The island transformation project is a collaboration with Telford & Wrekin Council, town and parish councils, but it particularly reflects the ‘core values’ of its mystery investor, not only in their workforce but also in the environment and in supporting the communities of Telford through their unique commitment to corporate social responsibility. The company behind the project believe that as a business they have a role to play in building a bright future for the next generation; the Hortonwood traffic island transformation will be an environmental improvement for the enjoyment of local communities, but it will also support road safety, promoting positive messages about road safety to drivers through its imaginative design. UPDATE: Hortonwood Community Island was unveiled on 19 October 2018, revealing more than just its creator, DENSO MANUFACTURING UK Ltd. The traffic island is at the pinnacle of a series of projects and represents DENSO’s collaboration with the local community, schools, councils, parishes and the general public, working to create a better environment while celebrating Telford’s 50th year. Its completion coincides with the opening of its legacy project, a state of the art skills and training centre, demonstrating the company’s ongoing vision for a safer and a brighter future for generations to come. Every aspect of the design of the island has been carefully thought through; from the cherry trees representing the boundaries of local parish council wards of Apley Castle, Hadley & Leegomery and Wrockwardine Wood & Trench, to the structure reflecting the company’s care for the environment. It will also promote messages that will support the local community, particularly road safety and will recognise the continued efforts by residents to improve the Borough.